Get maximum return using PPC. Pay Per Click Advertising (PPC) is web based advertising, and a key method of online marketing. In a similar way that you may place an advertisement in a magazine to sell a particular product or service, Pay Per Click is a method for placing an advert on a website search network to help attract customers to your particular business offering. 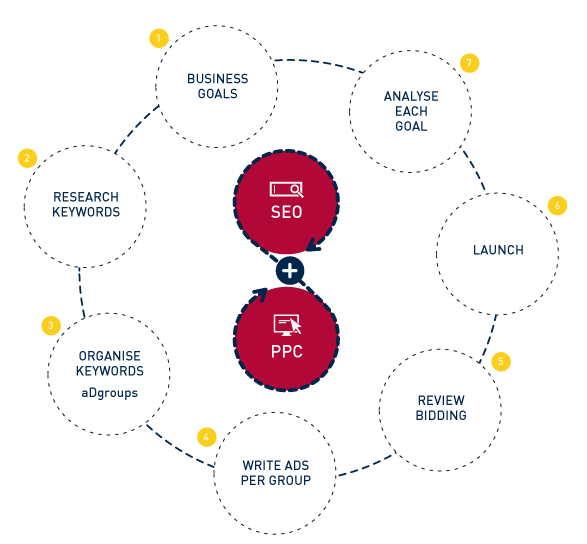 If you haven’t already experienced the benefits of using PPC, then here are a few to consider. Pay Per Click has a direct correlation to the volume of sales leads, enquiries and therefore the orders it generates – giving it a Cost Per Acquisition (CPA) metric. PPC advertising can be scaled to suit the objectives and budgets of the marketing campaign, no matter how small or how large. The larger and more aggressive the campaign, the higher the Cost Per Acquisition will be. It’s an ideal advertising medium method for Start-Ups, SME’s and Corporates to be investing in. In its basic form, a Pay Per Click campaign can be set up in minutes, run for a few hours and then disabled if required. Such flexibility ensures business objectives can be managed without compromise to the advertiser. With other forms of advertising, an advert will have to show through a mix of other messages and communications. With Pay Per Click, the sponsored search results are only displayed when a searchers is searching on a specific keyword or phrase. This enables a searcher to instantly relate their search to an exact search result, then giving them instant access to click through to a website or landing page offering a product or service to suit the searchers requirement. Aside from the written advert itself, Pay Per Click is all about numbers and the effectiveness of those numbers. While many PPC agencies choose to run their Pay Per Click Campaigns on instinct, the more successful campaigns are led by constant tracking and reporting on the performance statistics. Pay Per Click Advertising can be a quick and effective way of driving highly relevant traffic to your website and generating sales and enquiries. But managing an effective PPC advertising campaign is a difficult and time consuming job. This is where we come in.